Franklin Graham says he now hates the Republican Party as much as he hates the Democratic Party. That's a fib, of course, but he recently announced on Facebook that he was leaving the Republican Party over the Paul Ryan budget deal just passed in Congress and signed by the president. But he's also just announced that he'll be leading a 50-state "Get Right With God" tour to rally conservative Christians to vote for ... for whom? "Godly leaders," Graham says. He won't exactly say who fits that bill for him. In fact, he was quoted as vowing to let no candidates of whatever stripe speak at his rallies. Let's take a wild stab at nailing this down and suggest that no Democrats need apply for "godly." His rallies are meant to favor certain Republicans ... those despised Republicans who so recently failed to live up to Franklin Graham's exacting standards. 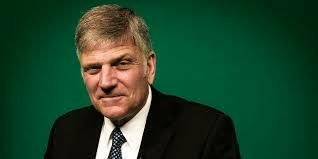 May we now call Franklin Graham a "RIEBN" -- "Republican in Everything But Name"? So very soon in Iowa, on the steps of the state capitol in Des Moines, Franklin Graham will invite all the good Christians to come rally for godly candidates just prior to attending caucus meetings in which everyone is supposed to vote for "Candidate To Be Named ... Never." In the twisted, deviant world of Franklin Graham, Donald Trump would likely be considered a "Godly leader" - divorced multiple times, lusting after his daughter (if only... he told the media), closing the borders to those fleeing from chaos and terror. Samaritan's Purse is no longer a charitable organization. It's an extremely lucrative money bag for its very political leader, Franklin Graham. The tax benefits need to be stopped as it is a political, not religious, organization. You show your ignorance with your comments about Sam's Purse not any longer being a charitable organization. While you are entitled to your misguided opinions about Franklin Graham, your uninformed views on SP as a charity are totally unfair and should have been challenged by the site moderator (except that he is as ignorant and biased as you). Sam's purse is highly rated by almost every single organization that rates charities. Around 85% OF ALL FUNDS RAISED go directly to program overhead and direct charitable use. SP has a 98.79% rating by "Charity Navigator", an "A-" Rating from Charity Watch, etc. etc. etc. While you are entitle to your asinine opinion, you are NOT entitled to your own facts. Do they receive money from the government for being a "faith based charity"? If so, how much? He uses his position as leader of Samaritan's Purse to be a political advocate for extreme right-wing policies - which include censoring books read at the local high school. Yes, Samaritan's Purse engages in charitable work, but it's run by a highly political leader who uses his position to sway political outcomes. He rallies his troops - many of whom home-school their children - to ban books at WHS. Graham's political grandstanding should disqualify his organization from nonprofit tax benefits. Graham's involvement in this effort is part of a wider effort by evangelical leaders to elect pastors and other candidates directly connected with ministries to government offices. Basically, it's a way for the evangelicals to focus more on their own "godly" candidates than to support the "non-godly" candidates on the general Republican ticket. This is one sick puppy. He fits in very well with the likes of Cruz, Trump, ISIS, the Taliban, and the nitwits that are now in charge of government in NC. I normally wouldn't bother to make any comments but this is one very hateful human being with a very sick agenda. It is a shame that he is provided with a stage and a microphone to spread his ugliness. He reminds me of the Nazi, Goebbels, in many ways. He needs to be in the limelight but has only evil to contribute. Jesus, God? They are not a part of his life, except perhaps in word.